Tumblr is a free, short-form blogging platform. It is fast-growing and popular with teens and college-aged users. It is owned by Yahoo. 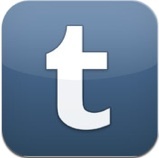 Tumblr is media heavy in that they make it easy for users to post multimedia content to their posts. You don’t have to include media, but if you look at other Tumblr accounts you’ll see a lot of gifs, images, and videos. Download the app and click the Get Started button. Choose whether or not Tumblr can access your contacts. Enter your email address, password, and username. Your username will also be part of the URL for your blog. Your blog’s address will be: username.tumblr.com. Take a picture of yourself or click the Skip button. Give your age and agree to the terms of service. You have set up your Tumblr! Now, dive in and write some posts. Here are some screenshots that should help get you started. Don’t forget to go back to Thing 1 to register your blog! Hennepin County Library’s Tumblr showcases items from their James K. Hosmer Special Collections. Cloquet Public Library’s Tumblr is a way for them to reach out to the community to let them know about library events and to promote reading. The New York Public Library’s Tumblr is very popular. Library Display Bonanza is a must read when you’re looking for display ideas. To find more, check out this long list of Libraries/Librarians on Tumblr or this list of Archives/Archivists on Tumblr. Also, try searching the #Tumblarians tag to find more library-related people and posts on Tumblr. Librarian Pride will get you smiling with the nice, sometimes inspirational stories about libraries. Librarian Wardrobe is exactly what it sounds like – pictures of librarians who want to show off their style. I Work at a Public Library is full of funny stories from the front lines of public library work. For more information about libraries and Tumblr, read the Library Journal article The Library is Open: A Look at Librarians and Tumblr. Here’s some more information about the Tumblr community that might be of interest to you. Commenting is different in Tumblr. If you want comments like you’re used to seeing on different blogs, you have to go to your Settings and allow people who you follow to comment and people who follow you to comment. As you’ll see, you can’t allow just anyone to comment anonymously or as a guest in Tumblr. In order to comment on a Tumblr blog you have to have a Tumblr account. Another way to comment is to repost a blog post. When you repost something to your own Tumblr account you can add a comment. It will then repost the whole post on your account with your comment added. Again, this idea of reposting in order to add a comment is something that can only be done if you have a Tumblr account. So it is possible to comment in Tumblr, but it’s just a bit different than other blogging platforms you may be used to. For more information on reposting and commenting, check out numbers 3 and 4 on this page – 10 Useful Tumblr Tips That New Users Need to Know. Another thing you should know about Tumblr – gifs. People on Tumblr love gifs. Gif actually stands for Graphics Interchange Format, and on Wikipedia you can read a long, technical post about what gifs really are. But when you’re thinking about gifs and Tumblr, think of gifs as the looping animations people include with their posts, like this long list of book gifs Library Journal collects. You can find gifs on many different websites like Imgur, KnowYourMeme, GifBin, GifSoup, or create your own. If you want to make your own, look at these instructions from Gizmodo – How To Make a Gif in Five Easy Steps. 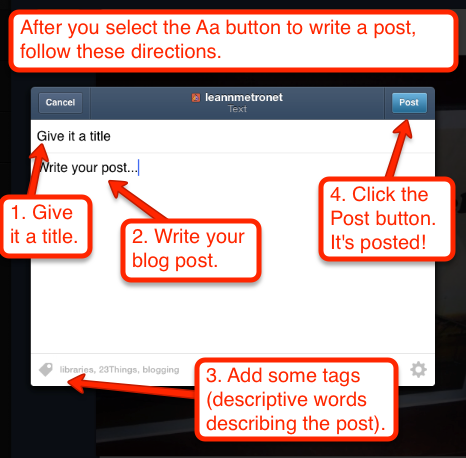 Tagging is how you can organize your Tumblr posts, but it’s also how people can find your blog posts. According to the article Tumblrarian 101: Tumblr for Libraries and Librarians, tags are how people will find your posts. When people search for posts, Tumblr searches the tags attached to posts, so you need to add some tags. Tags are also good ways for you to find items. Search tags like #tumblarians, #libraries, and #librarians to get started. Earn badges for your progress! See #6 under the FAQs for details on how to get your badges! This statewide program is brought to you by Minnesota’s seven multicounty multitype library systems (multitypes). The multitypes improve library services by promoting & facilitating cooperation among the academic, public, school library media centers, & special libraries within their regions. This program is part of the professional development that all of the multitypes provide for the library staff of their members. All content for this program has been created by the Minnesota Multitype Library Systems. This content is licensed under a Creative Commons Attribution-Non-Commerical-Share Alike license. Please attribute any use of this blog content to the Minnesota Multitype Library Systems. All versions of The 23 Moblle Things logo, including the badges, are © Minnesota Multiype Library Systems.